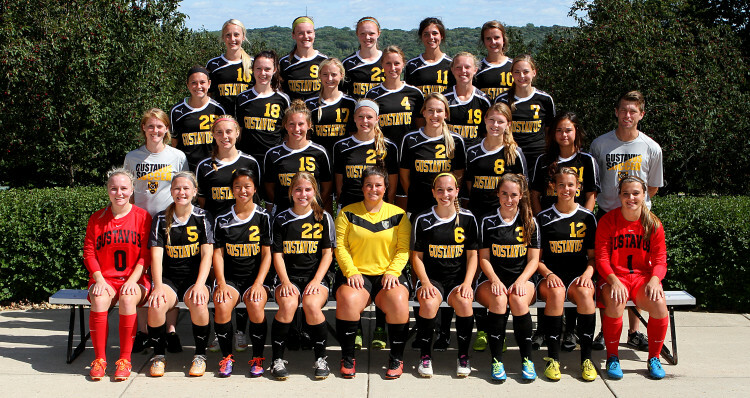 The 2015 Gustavus Adolphus women's soccer team (photo courtesy of SPX Sports). St. Peter, Minn. – The Gustavus Adolphus women’s soccer team kicks off its 2015 campaign at 1 p.m. Tuesday at the Gustie Soccer Field, playing host to UW-Eau Claire. Head Coach Laura Burnett-Kurie begins her fourth season at the helm and is excited about the potential of this season’s team. “We’ve been rebuilding over the past couple years and this is really exciting because we are bringing in a lot more depth and some missing pieces to the puzzle that we haven’t had in the past,” Burnett-Kurie said. Last season, Gustavus finished with an overall record of 2-13-3 and a 1-8-2 mark in the Minnesota Intercollegiate Athletic Conference. By adding depth with 10 first-years to this year’s squad, Burnett-Kurie believes the Gusties will be able to compete in the final minutes of the match, which was a time that proved to be problematic last season. “Last year we had a lot of injuries so that prevented us from having a lot of depth, so our girls got tired when it got to the 75th minute, which is when we gave up a lot of goals,” Burnett-Kurie said. The captains this season include senior forward Brittany Chase (Victoria, Minn.), junior midfielder Coursey Edwards (Eden Prairie, Minn.) and junior forward Jana Elliott (Eagan, Minn.). Coach Burnett-Kurie says the team’s style of play is possession oriented, which is coined the “Gustie Tempo.” The Gustie Tempo involves one- or two-touch soccer, finding a rhythm and playing in a creative offense. Burnett-Kurie is relying on her captains to enforce the Gustie Tempo and lead by example. “Brittany is the first person that I’ve coached all the way through for four years,” Burnett-Kurie said. “So she really understands the culture of the program and what we’ve been trying to build. She’s seen a lot of improvement, especially coming into this year. Junior forward Maddison Ackiss (Fairbanks, Alaska) returns as the team’s top point-scorer. The West Valley High School product scored 10 of the team’s 17 goals last season. She started in all 18 matches and added two assists for 22 points. Ackiss posted a .238 shot percentage and a .524 shot-on-goal mark. First-year goalkeeper Ashley Becker (Farmington, Minn.) steps between the posts in place of graduated keeper Caroline Olson. Be strong, play fair, have fun, and above all else: listen to your coach!